Yesterday it became official: After 20 years of marriage, I am officially 31 pounds heavier than I was on my wedding day. But I am too busy getting sober, raising teenagers, losing my reading glasses, finding myself, and holding on to the time I have today with loved ones to really give a damn. Another thing became official in the last week: my husband believes in the regular “God Winks” I am receiving from my Dad. 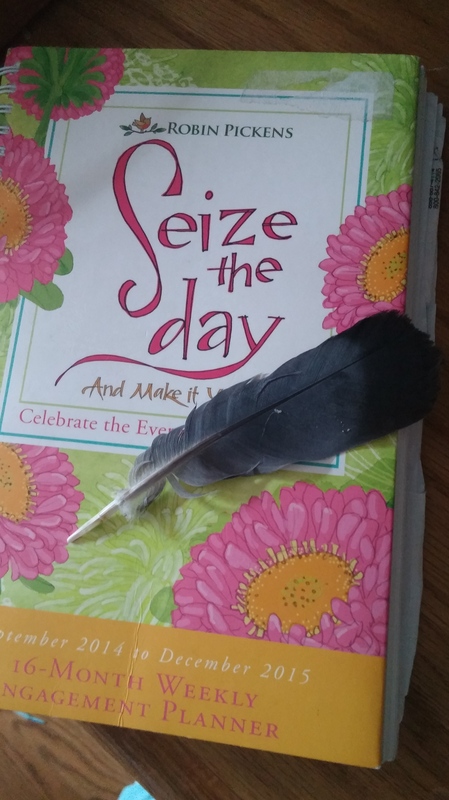 I have had some really awful moments in my struggle for sobriety these past 156 days – and Daddy always appears at just the right moment, in the form of a feather. I’m holding on and letting go to everything and everyone these days, it seems: my beautiful teenagers; my youth (and former figure! ); things that used to matter but really don’t anymore; my dreams of who I wanted to be and reckoning with the reality of the time I have left to fulfill them or make new ones. 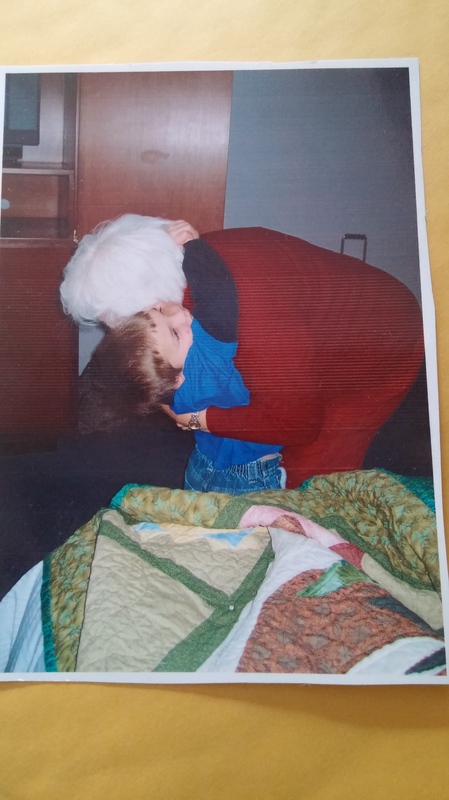 Grandma Rhetta gets a BIG hug from 5-year-old Mario for the beautiful quilt she made him. I am still thrilled and sometimes even enraptured by the journey of life – including the scars I carry as a mid-lifer. It’s wild to ponder the things that matter more to me now that I know I don’t have a lot of time on this Earth. I care more about being gentle and kind than winning, at anything. I worry less about deadlines and more about resilience and protection (social work lingo that I love!). We live among the wounded and I want to be a healer. Sally Wilcox. my dear friend, passed these along to me when my family was treated unkindly in a small town. She became a Deacon in the Episcopal Church very late in life and never shied from “sticky” situations. I will always cherish Sally, these earrings, and the brief time I had with her. I guess the trick to living a life of Grace after 50 is to know when to hold on and when to let go. I cannot be in this state perpetually! Luckily, I have had some pretty wise friends share their wisdom with me along the way. Remember the movie, “Fried Green Tomatoes”? I picture myself often as the character Kathy Bates plays – Evelyn – that awkward midlife woman, pathetically hanging on to a shell of her former self until she meets Jessica Tandy’s character – Ninny – the older woman in the nursing home who shares the story of her relative, Idgie, in segments for Evelyn, and gives her the gift of strength to prepare her for old age. I had a friend like Evelyn in Winfield, Kansas. Her name was Sally Wilcox and she was a writer. 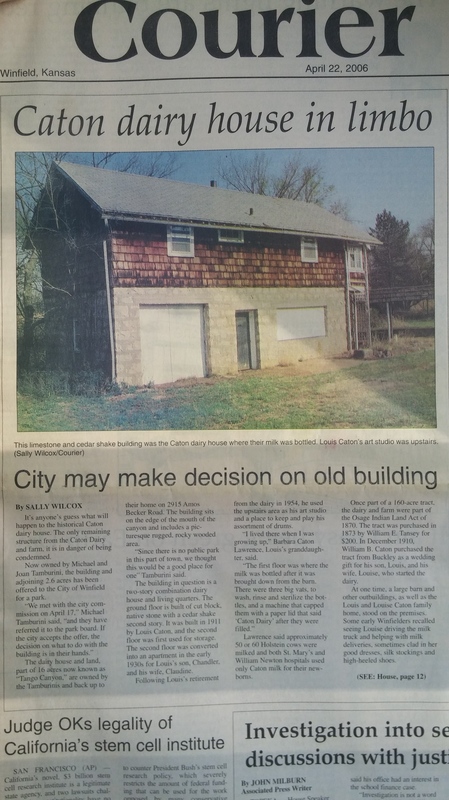 She volunteered to write an article about an old dairy house on our land adjacent to a neighborhood development. Mike and I saw beauty and grace in this old structure. Our neighbors saw blight. They wanted it torn down, we maintained it had Historic value and submitted to the City’s requirements that it be boarded up. Who would have thought that a historic dairy house would be the “mountain we chose to die on” in our small town experience? We learned a lot, thanks to Sally. The dairy house was designed and lived in by a relative of a well-known architect from the region. Louis Caton, a musician, lived there for a period of time and was a known local artist and musician. We romanticized the past and the things that transpired in the old dairy house but to the neighbors, it represented a hatred they carried for the former developer of their neighborhood and broken promises. It was ours but, in the end, it was not. Our fight did not matter because the neighbors won the right to tear it down, after all. Looking back, I realize the dairy house was just a symbol to Mike and me of something beautiful we had found and wanted to “tend to” for our children. We imagined a future for them in rural Kansas and all the cool things they might get to do with this beautiful barn like structure set beside a wooded canyon that many children, including Osage Indian children and pioneer children, had played in before. But maybe we held on to the wrong thing at the wrong time for the wrong reasons which now, ultimately, does not matter. But I cannot stop thinking about the twinkle in Sally Wilcox’s eyes as she interviewed us and published the article in the local newspaper about it. In all her wisdom, Sally thought the fight was worth it and she liked us, unlike our neighbors! 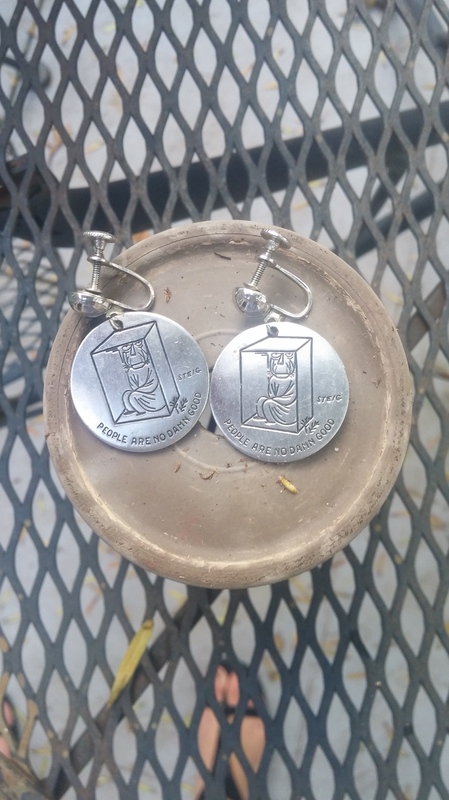 One afternoon before a public hearing about the condemnation of the dairy house we were forced to attend at the City, Sally gave me the earrings she wanted me to wear bearing the words: “People are no damn good.” I will always love her for her strength and courage and carry with me the memory of my very own “Evelyn,” who helped me confront one of my first ugly midlife battles over WHAT to hang on to and WHEN to let go. So, here I am, almost 50, getting feathers from Dad and remembering a brilliant older friend who gave me many gifts of wisdom. In their own ways, they both sustain me as I daily weigh what’s worth my energy and what’s not. Well, God bless floating feathers and husbands who recognize the message they carry! I’m taking a moment to say a prayer of gratitude for my own Sally (I call her “Beth”). AND, you have taken me to yesteryear with a reminder of what screw-earrings looked like – I can still feel the “ouch!” of an overzealous closure! Amen! Great to hear from you and thanks. Happy Monday! Then other times I’ll watch people fill situations with unnecessary drama and strife and I’ll sit back and think, “What’s all the fuss about? You people need to breathe.” That’s when I know that grown-up or not, what I’ve gained after all these years (and sobriety) is the “wisdom to know the difference’. Awesome post girl! I just love the way you put words together. Thank you so very much, Sherry. We continue to grow and learn together, don’t we? I freaking love the internet and social media! Happy Monday, friend. The child hugging his grandma made me tear up. You are very kind. Thank you for commenting and I am sorry for the delayed response. Happy New Year!!! The Official Blog of Bistro Kids and the Farm 2 School Lunch Program!